In a recent case before the New Jersey Appellate Division, the judges technically ruled against a spouse who sought to terminate an alimony obligation where the other spouse had remarried in every sense but the legal one. However, the court’s opinion offered helpful suggestions on how the paying spouse might nevertheless terminate her alimony obligation. The couple at the center of Sloan v. Sloan divorced in 2014 after 24 years of marriage. Their Matrimonial Settlement Agreement (MSA) provided that the husband would receive permanent alimony until either his death or remarriage. The alimony was slated to begin in April of 2015.
done everything to be married except for issue the certificate [sic] in an attempt to avoid losing alimony, and I find that to be intentional. And I don’t think that’s equitable and I don’t think that that’s fair. . . . I don’t have a marriage whatsoever. But I have someone taking all the steps there are to be a married couple just to solely twist or abuse the language, what a “marriage” is. And that I’m not going to permit in my courtroom. The judge terminated the wife’s alimony obligation, and the husband appealed. The Appellate Division began its inquiry by looking at the New Jersey statute defining marriage. According to the law, any marriage where no marriage license has been issued is considered void. The Appellate Division Concluded, based on this statute and on other cases where couples similarly made a decision not to obtain a marriage license, that there was no marriage. For that reason, the Appellate Division ruled that the trial court judge had made a mistake in finding that the husband had remarried and that the wife’s alimony obligation should terminate. However, the Appellate Division pointed out that, even though the alimony obligation might not terminate, the amount that the wife is obligated to pay could be reduced. While some couples include what’s known as an “anti-Lepis” provision in their MSAs which would prevent a modification of the amount of alimony owed, this couple had not included one. The opinion noted that the wife would have an opportunity to show that her former husband’s economic circumstances changed when he began cohabiting with his girlfriend in order to reduce her alimony obligation. 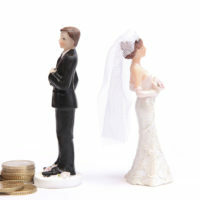 The judges also pointed out that, in the intervening years since the MSA had been created, New Jersey’s alimony laws had changed to allow payor spouses to terminate their alimony obligation when a former spouse begins cohabiting with a new partner, even if the alimony-receiving spouse’s financial status hasn’t changed. The judges concluded their opinion with the helpful suggestion that the wife make this argument when the parties return to the trial court to discuss a modification to the wife’s alimony obligation. For assistance with a case before the New Jersey Family Part, such as a divorce or disputed custody matter, contact the effective and knowledgeable Union family law attorney John B. D’Alessandro for a consultation, at 908-964-0102.